The technological landscape has reshaped the way white collar workers cultivate and promote their businesses. 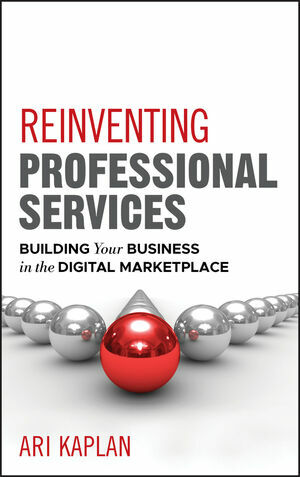 The Transformation of Professional Services is an engaging look at how licensed experts are adapting to today's dynamic economic environment. From Ari Kaplan—a recognized advisor on business and career development— Reinventing Professional Services: Building Your Business in the Digital Marketplaceoffers insights on taking advantage of enterprising techniques to stand out and position one's self as an insightful chameleon rather than as an isolated purveyor of facts and figures. Written in a straightforward and accessible style, this book provides engaging guidance for anyone in the professional services field—from business consultants, financial advisers, and lawyers to accountants, real estate brokers, and appraisers. Ari Kaplan is a business strategist who spent nearly nine years practicing law with large firms in New York City. He provides copywriting services, as well as training on communications, career growth, business development, publishing and networking. Mr. Kaplan is the author of a book on standing out and creating opportunity. He has appeared on CNN, been featured in a variety of newspapers nationwide, and has written more than two hundred articles for a wide range of national and international publications. Learn more at AriKaplanAdvisors.com and ReinventingProfessionals.com.